Warnings will no longer be issued for violations of our ATV regulations. Violations will carry large fines and/or loss of privileges. PMWFCA offers rewards for information leading to the arrest and prosecution of those committing crimes within our community. ATV’s of any type are PROHIBITED from community roads and common areas. Because ATVs operating contrary to our rules and regulations are also by extension violating PA State ATV laws, after one warning, the offenders will be penalized by the PMWFCA and are being reported to the proper State authorities. The PA ATV penalties have been recently increased due to the numerous complaints statewide about ATV operators’ disregard for the law. Our Security personnel have been supplied with video cameras and recording devices to document violations. FYI, there are no privacy issues where there is no expectation of privacy. For instance, noisy ATVs riding on community roads are not seeking privacy. Also, due to threatening phone messages, verbal threats and harassing communications directed towards security personnel and those responsible for promulgating our rules and regulations, a zero tolerance has been established and such incidents are being referred to the PA STATE POLICE. You hit an ATV and get sued. Your child is injured tripping over an ATV rut on our recreation fields. You are hit or injured by a speeding vehicle. You are sued by a trespasser. The Snowmobile and ATV Law was amended June 25, 2001. Significant changes affect nearly all ATV owners and operators. 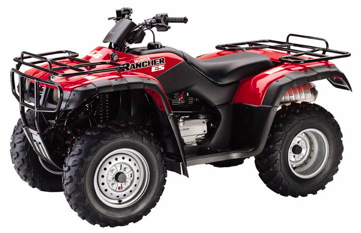 The changes were made to reduce illegal ATV riding on public and private lands. The new law also provides grants to organizations to help establish new ATV riding opportunities on private lands. This summary is for general information purposes. It is not intended to be a complete explanation of changes in the law. IMPORTANT: An ATV used exclusively as utility vehicle for agricultural or business operations is exempted from the definition of ATV under Act 68 and therefore is not regulated by Chapter 77. Class II: Width exceeding 50 inches or a dry weight exceeding 800 lbs. Please note: If a portion of state forest is posted as open to ATVs, only Class I ATVs may be used. No state forestland is currently open to Class II ATVs, without special permission from a district forester. For an ATV used anywhere off of your own property, such as designated state forest ATV trails. Operator of vehicle must carry a registration certificate. Vehicle must display a registration plate and expiration sticker. Plate must be affixed to the back of the ATV. Registration may be suspended or revoked if person violates any provision in Chapter 77.
b. Limited registration A limited registration is provided if the ATV is operated solely on one’s own land. THIS IS A FREE REGISTRATION. Vehicle must display plate affixed to the back of the ATV. No expiration, unless ownership of vehicle changes. IMPORTANT: There is no grandfathering provision—so effective October 23, 2001, vehicles not required to be registered under previous law because used solely on own land must have limited registration. For limited registration, there is no fee. Regular registration fee is $20 for an expiration sticker (required for registration), which is good for two years. This fee is the same as previous law. Fee for replacing lost or damaged items is $5. Fee for transferring registration is $5. Fee for recording the name of a secured party (i.e., a lien holder) on a title is $5. This is a new fee. May operate only Class I ATVs on road, trail, area designated and marked by DCNR as open for ATVs or with specific written permission. May operate a Class II ATV on road, trail, area only with specific, written permission. Registration plate does not give an ATV user the authorization to ride on public highways or state forest roads posted as open for "licensed motorized vehicles." Liability insurance is now required for ATVs. However, liability insurance is not required for persons with limited registration. Penalty for 1st offense is now $50-$200 (previous law: $25-$100).